Congratulations to everyone involved in supporting Hughes! I’ve had plenty of great highlights in my years working for WWTS, but few are as special as the recent honor I had in accepting several awards from Hughes during the 2018 Hughes Installer Conference (HITS) in Lansdowne, VA in August. Randy Rousseau, Bernie Johnson, and I attended the HITS Conference awards banquet on the evening of Monday, August 6th. There were literally hundreds of installers representing dozens of Consumer and Enterprise installation companies in attendance, but we go to find out about new products, new systems, advancements in installation and service tools, etc. Since this was primarily an installer-focused conference, we were not expecting WWTS to be mentioned much and frankly, I wasn’t listening very closely. But when they started the presentations for outstanding performance, the words “and the award goes to Worldwide Tech Services” got my attention! Before the evening was over we were called up to accept a total of three awards on behalf of everyone at WWTS involved with supporting Hughes. 1. “Enterprise – Service Call Metric (least amount of service calls dispatched in 1st 60 days after installation) SILVER CLUB” – This metric is for the least number of service calls (out of all installers) generated after installation. What that means is customers are not seeing outages or service calls generated within the first 60 days following installation. This is a real testimony to the work that you’re doing when you install Hughes products – it’s getting the job done right the first time. Hughes’ customers are experiencing the fewest failures within 60 days when WWTS does the install! 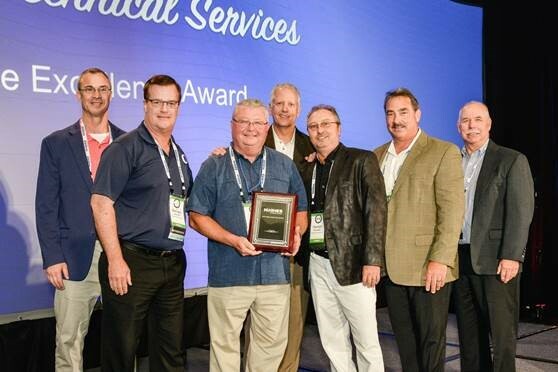 (L to R): Dave Zatloukal, Hughes Sr. VP North American Operations; Cliff Rees, Hughes VP Installation and Field Services; Bernie Johnson, WWTS Product Support; Bob Johnston, WWTS VP Client Management; Randy Rousseau, WWTS National Operations Director; Ray Van Meter, Hughes Director of Enterprise Installations; Ed Conklin, Hughes Sr. Director of Installation Services. 2. “Special Award in Support of Disaster Recovery” – This comes in recognition of our outstanding response to the devastation caused by the three hurricanes that hit Houston (Harvey), Florida (Irma), and Puerto Rico (Maria) in 2017. 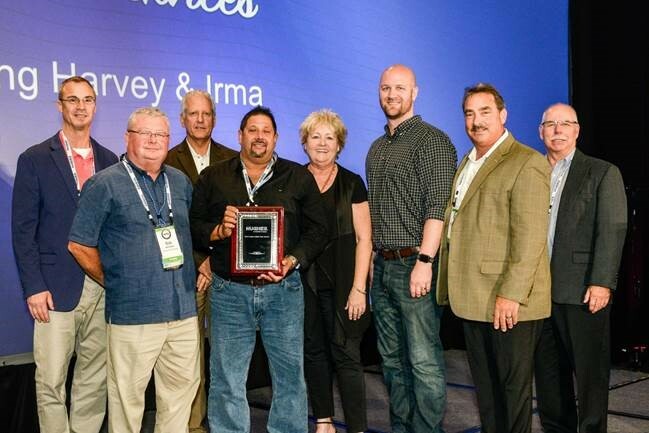 We shared this award with Atlanta Network Systems, who primarily did the replacement Enterprise installs in the disaster areas for unrecoverable sites, while the WWTS team did all of the site recoveries for sites impacted by the storms. We could not accept this award without giving a special shout out to all the technicians who left their homes behind and spent weeks in the disaster areas helping us to recover 1,442 sites brought down by the storms. We cannot forget the many hours worked by the Branch Managers, SFOSs, and AMs – and Gabriel Baez from HyTech, our contractor in Puerto Rico, who all worked tirelessly to keep things moving and helped us work effectively to recover the many sites damaged in their territories. But special recognition goes to Adrian Stetson and James Trujillo who, except for a short break during Thanksgiving, spent nearly 6 weeks living and working in Puerto Rico. Stetson and Trujillo ran calls for 12-16 hours per day under difficult, stressful, and often hazardous post disaster conditions during the worst times following the massive devastation caused by Maria. Thank you to all who stepped up and helped us with the recovery effort! (L to R): Cliff Rees, Hughes VP Installation and Field Services; Bob Johnston, WWTS VP Client Management; Dave Zatloukal, Hughes Sr. VP North American Operations; Gabriel Baez, Owner, HyTechPR; Vicki Burrell, Atlanta Network Systems; Brian Oglesby, Atlanta Network Systems; Ray Van Meter, Hughes Director of Enterprise Installations; Ed Conklin, Hughes Sr. Director of Installation Services. 3. “Hughes Service Excellence Award for Distinguished Service to Hughes Above and Beyond” – Perhaps the award you should all be most proud of receiving! In nearly 25 years, Hughes has never awarded us with this recognition. In presenting the award, Hughes Senior Management commended you all for being an outstanding service partner, for “pulling their behinds out of the fire” on more occasions than they could remember, and for being willing to go above and beyond to support Hughes and their customers. Everyone at WWTS who touches the Hughes account in any way, no matter how small or how great, should give themselves a pat on the back for the outstanding support and the team working together to deliver service above and beyond! 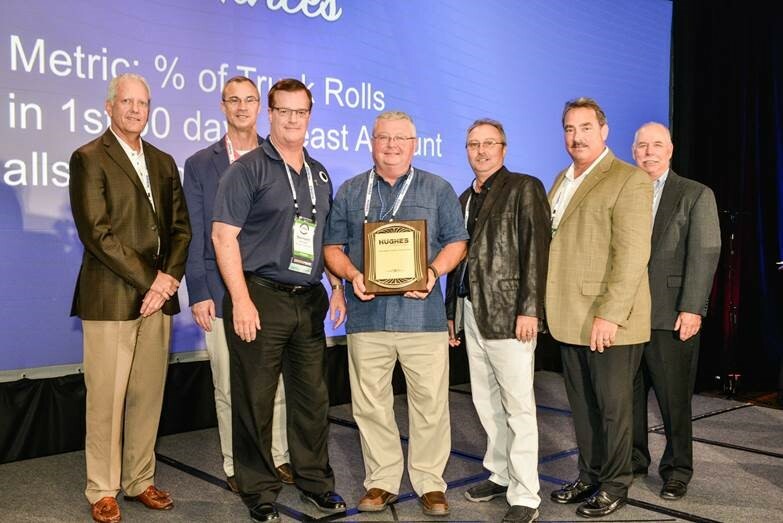 (L to R): Cliff Rees, Hughes VP Installation and Field Services; Bernie Johnson, WWS Product Support; Bob Johnston, WWTS VP Client Management; Dave Zatloukal, Hughes Sr. VP North American Operations; Randy Rousseau, WWTS National Operations Director; Ray Van Meter, Hughes Director of Enterprise Installations; Ed Conklin, Hughes Sr. Director of Installation Services. I’m excited to bring these awards home to you, and I’m very humbled and honored to be working with such a dedicated group of people. These awards represent all the little things you do to make customers happy and for all the extra miles you go every day to support Hughes. Thank you all for your hard work, perseverance, and contribution to such genuine and appreciated recognition from our largest customer!